To me, orthodontic treatment is so much more than straightening teeth. It is an opportunity to create relationships and build friendships with people of all ages whom I would never have the chance to meet otherwise. I love being part of the journey with a teenager who won’t smile at our initial appointment because of embarrassment about his or her teeth and then seeing the patient give me a wonderful smile the day we take the braces off. I love hearing adult patients tell me they can chew with teeth that they have never been able to chew with before. It’s the most gratifying part of my work, and what I look forward to doing every day. Moving teeth into the right position is something I do, but if teeth weren’t connected to people I wouldn’t wake up every morning excited about what I do. It’s the people that surround the teeth that makes orthodontics interesting. I love meeting people and hearing their stories and then becoming part of their story. Orthodontics is experiencing an explosion of innovation. New technology is allowing orthodontists to significantly improve our understanding of how teeth move and the limits of tooth movement. Continuing education allows me to share these improvements with my patients. Medford is a fairly isolated outpost; it is what I love about living here. By interacting with doctors from all over the country, I can provide highly advanced ideas and treatment modalities in a small town. I am a past president of the Southern Oregon Dental Society, and have been the past president of the board for the Children’s Dental Clinic (which provides free dental care for the working poor). I helped organize the Medford Mission of Mercy that provided two days of free dental care to more than a thousand in need. I am also active in the Boy Scouts. I have been a scoutmaster, assistant scoutmaster, and district chairman, and am currently a cub master. I am active in my church, where I have the chance to teach youth groups. Serving gives my life meaning. It gives me a chance to improve the lives of my neighbors and friends. I am married to the beautiful and vivacious Kristi and we have five children: Mary is married and graduated from BYU with a degree in elementary education. She has two kids, Ben and James. Being a grandpa is the very best! 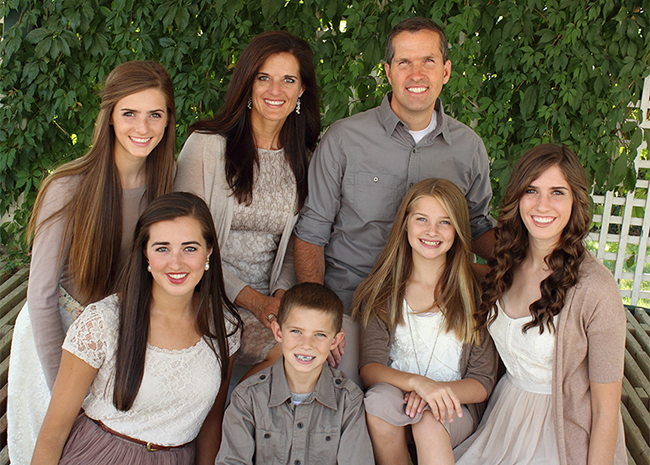 Sarah is married to Chris Keenan and graduated from BYU with a degree in English. Rachel finished her mission in Slovenia and is currently studying at BYU. Emma and Luke are still at home and are both basketball junkies, to my great joy! I would be remiss to forget Lulu, our labradoodle who can say “I love you.” (if you have a great imagination). Being at home with my family is the best way I can think of to spend my time. I love reading with my kids, playing basketball, running, camping, and skiing with my family. I also love playing the piano, singing, and writing music. I listen to the Beatles, James Taylor, Train, and a slew of other newer groups that my kids tell me about. I am the luckiest man on earth.